Bowen sits on a peninsula, with ocean to the north, east, and south. On the western side, where the peninsula connects with the mainland, the Don River’s alluvial plain provides fertile soil that supports a prosperous farming industry. The Don River drains a flatter inland area immediately south of Bowen township and west of the Bowen River. 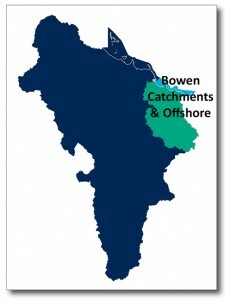 The Bowen and Broken rivers are tributaries of the Burdekin River. They start about 50km from the coast and combine to flow north-west for 100km to join the Burdekin River below the Burdekin Falls Dam. The Broken River is the shorter tributary flowing from Mt Bruce through a valley to Eungella Dam before joining the Bowen River. Picturesque creek scenery, lush rainforest remnants and grassy open eucalypt forest are features of inland national parks and state forest areas at Eungella, Mt Aberdeen, Sonoma and Crediton. Around Eungella, there are mist-shrouded mountains, and the forested national park hosts 860 plant species and a wide variety of wildlife. Cape Upstart National Park is an imposing granite headland covered in a range of vegetation types from vine thicket to heath, and flanked by sandy beaches. Significant areas of beach scrub and coastal dunes are protected in the park, and adjacent marine areas are included within the GBR Marine Park. There are important turtle breeding sites on the sub-region’s beaches, and the coral reefs around Bowen feature several shipwrecks. The coastal waters include seagrass-dominated, shallow marine environments of the GBR Lagoon, and Edgecumbe Bay is a declared Fish Habitat Area and Dugong Protection Area. Bowen township has a population of around 9,500. The area has a diversified and prosperous economy based on agriculture, fishing, tourism, and mining. Its climate and fertile alluvial soils support a thriving horticulture industry, comprising small crops such as tomatoes, rockmelons and capsicums. Inland, away from the alluvial plain, cattle grazing is the dominant land use. The offshore seagrass meadows support the local commercial fishing industry. Collinsville is an older mining town of around 1,500 people in the coal-rich Bowen Basin. It is connected by rail to the Abbott Point coal terminal which lies 25km north of Bowen. Mineral resources and mining are the largest economic contributors to the sub-region. Coal is mined inland of Bowen from Newlands, Collinsville and Sonoma mines in the Bowen geological basin, and exported mainly to China and India. Expansions of the established rail network have been proposed to service potential Galilee geological basin coal mines in the Belyando-Suttor sub-region. The sub-region has potential to expand mining and agricultural development, however any decision would need to carefully consider implications for natural resources, including water availability, land capacity, and the need to protect adjacent coastal wetland, marine and reef environments. There is potential in the Collinsville area to develop renewable energy projects, including a hybrid solar thermal power station at the site of the Collinsville Power Station.